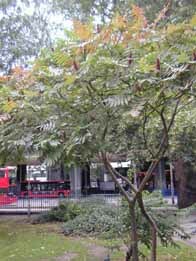 Above: a sumac at Euston. The fruit of the sumac tree makes for an unusually exotic sight in gardens of the east-end of London. They conjure up ideas of giant poisonous buds of the type depicted in Tarzan movies. pinately compound leaves; leaflets opposite. nuts/fruit: the trees most striking characteristic; conelike; upright; vary in colour depending on the tree, scented; known as sumac bobs. yellow clusters in upright cone shape. grows up to 10 metres, but most are a lot smaller; round; more a large bush than a tree. general: very common in gardens in suburbs; rarely planted in central London. the path leading to the station bends. Marked in light green on the map.